Asus Aura Concept Phone | BlackBerry Blast! Check out this Asus Aura concept phone designed by a Hungarian company Egy Studio. Looking like it is inspired by the Apple iPhone, the Asus Aura takes it to the next level with a few interesting innovations in its 6mm thick housing. One very cool feature is a sliding QWERTY keyboard. Another innovation is movable navigation module that appears to slide from the top to the bottom of the face of the phone. The Asus Aura include uses a 3.9″ touchscreen , 2 megapixel camera, microSD memory card slot, GSM, UMTS, HSDPA, Wi-Fi and Bluetooth. 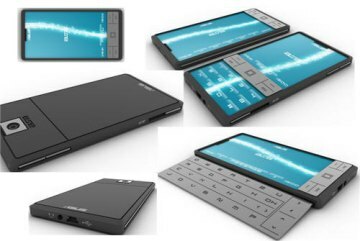 Too bad this is only a concept phone. We'll have to wait a few years to see it on the market.